The head of the School Trustees Association has asked Education Minister Anne Tolley to explain why she wrongly claimed the association was "extremely supportive" of national standards. Mrs Tolley fought off criticism yesterday after it was revealed that parents in charge of 48 school boards had written to her at a rate of more than one a week complaining about aspects of the national standards. Answering questions in Parliament, she said she had been to the annual conference of the STA and found president Lorraine Kerr and her executive were "extremely supportive" of the standards. Mrs Kerr had won a standing ovation from the 600 delegates at the conference, Mrs Tolley said. "I think that's a very good sign that that conference of 600 representatives were supportive of their stance." But Mrs Kerr said yesterday that she had "never said" boards were supportive of the policy. Mrs Tolley's claims about the standing ovation were "an awkward one to answer". The ovation had been in recognition of her 21 years of service as a school trustee. "Possibly that's a conversation I need to have with the minister. National Standards are an ideological attempt by Tolley to introduce a fake competition into the Education industry by using these flawed measuring standards to secretly build a league table which would benefit National's mates in the Private Education industry, being forced to listen to Tolley lie about how people support this joke is almost as excruciating as watching Heather Roy and Rodney Hide kiss and make up. This is NOT about the educational achievement of NZ children because national standards like this are pointless because they show nothing of any educational value because children develop at very different stages this early on in their educational life. How do we know this to be true? Because our undisputed educationalists like John Hattie bloody well tells us so! Could be the most disastrous education policy ever formulated. Will only barely raise student achievement, if at all. Could "pervert the nature of teaching" by pitting schools and teachers against one another. Hattie also writes that the standards themselves – the targets students will be measured against – are "untested and experimental" and need to be drawn up based on evidence, not committees. AN OFFICIAL report reveals one-third of parents had concerns about the new national school standards system before it was launched – despite the government's claims the system has a "strong mandate" from parents. These league tables National have been trying to smuggle in under the national standards regime have been sold to NZ as having the support of parents yet an official report released shows that 38% of parents made negative comments about National’s plans and only 14% made positive comments. Yet Education Minister Anne Tolley’s press release on the report read, ‘Patents support National Standards’ – no they didn’t only 14% did, 38% were negative. NZ - you are being conned over these National Standards, teachers must refuse point blank to implement them, and we must support teachers in their refusal. 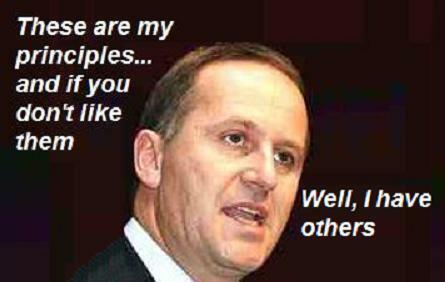 Get John Key and his free market ideology out of our classrooms. Remember, our own educational experts have trashed this policy, why would you let John Key implement them when the experts have trashed them? It's your kids educational future you are allowing John Key to mess around with. LOL 'undisputed educationalists'. You should know of all people that the social sciences are based on ideology and if so then there is no 'truth' simply a perspective. In this case yours happens to be on the wrong side of an argument. For every 'expert' giving an opinion there are 5 more willingly to give a contrary one. I am super annoyed at the moment-after reading that Anne Tolley is going to the world forum to pretend she is an educator and to talk about flagship initiatives like..can you believe it National Standards! It is a wonder I didn't choke on my bile! More than likely someone will use a big educational word and she will end up embarrassing all of NZ!! She is going to visit schools and pretend she is the big educational leader..a woman who is not even in education!! Anyho before I explode and make a mess of your site-can I get you to sign up to my new version of www.teacherslounge and read my blog about this! I wrote it while thinking unmentionable words so it would be cool if you could tell me what you think-all advice happily accepted...and do leave a comment!